What on earth would you wear this with? Sometimes you take a chance. More often, it is placed back again on the hanger and you leave the store in despair. Most likely while you talk to yourself about what you could possibly wear it with. A little too dramatic? Okay, maybe a little. But isn’t this scenario frustrating? Especially when modest, cute things can be so hard to find at all!So here’s a few words of caution before you walk out of the store. If you see something that you absolutely love but you have no idea what you would wear it with…GET IT! Take it home and try it with a bunch of pieces from your closet. (Or your sister’s closet, or your mother’s closet. Or your friends’ closets…) Chances are, the answer may already be in your very own wardrobe! Let me show you a few ways I’ve styled one of the chances I took with an item that can be hard to wear: a lace skirt. If you’re like me, you love giving a vintage vibe to your outfits. This one brings in today’s prints with yester-year’s silhouettes. Just like any great outfit should, it can work for many different events: Work, church, a party…you name it! You don’t have to find a structured blouse to make this outfit work either! Just tuck in a wide-cut chiffon blouse into a high waist skirt and you’ve got two tops for the price of one. The floral top adds pattern and color, while the lace skirt adds texture. A skinny red belt helps define the smallest part of your waist, because it brings your eye straight in. Red peep toes and a antique bracelet add some vintage charm. Such an outfit gives you the basic formula for any high-waisted skirt: skirt+blouse+belt=success! Our previous tucked-in blouse wasn’t quite as structured as this top, with its pleating and high collar. This look is quietly beautiful. In a way, I believe the silhouette, and completely solid base makes this outfit feel a little bit dressier than the first outfit and gives you a canvas to experiment with! Because both of the pieces in this outfit are solid, any accessories you add will steal the show. You can add major POP to to the outfit just by what you wear with it. It also gives you a chance to spend a little more on the clothes themselves, since changing inexpensive accessories to create different looks is a lot cheaper and easier than buying a whole new outfit. Some people might think a lace skirt can only work for dressy occasions. But that’s not true! To me, this third outfit gives a “walking down the boardwalk at the ocean, with salty breeze in your hair” kind of vibe. The white polk-dots, again, add pattern. Overall, the top and embellishments bring much needed pops of color. Knot the front of the shirt, thrown in cute sandals and a funky/tribal bracelet to make it even more casual. If you can take anything away from this outfit it should be this: one dressy piece in an ensemble can be dressed down with all the other items you choose. 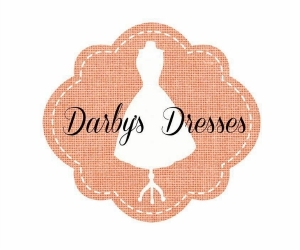 Don’t leave those pretty “special occasion” pieces you love in your closet with no chance to wear them. Instead, learn to pair them in such a way that you can bring ’em out and enjoy ’em all the time! 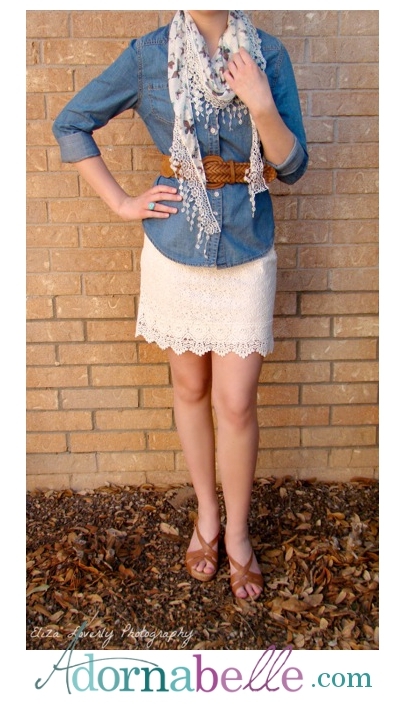 This outfit really takes two items that can be difficult to wear (a denim shirt & lace skirt) and throws them together. The wide belt is super slimming. A scarf adds many layers of texture, also bringing in the extra color this look needs. Remember, layering pulls an outfit together. It can let others in on your personality (are you playful, ethereal, vintage glam?). You can also play this look up with your accessories! Keep in that they should always contribute to the overall look, never take away from it. Instead of walking away from an item you’re not sure what to do with, the best idea is to take it home and see what happens. Next, dig into your closet and stand in front of the mirror and see what you can create with what you have already on hand. The worst case is you will discover it really isn’t you after all. But you never know: you might end up with several new outfits from your own closet that you never knew you had! Plus, you’ll probably have a lot of fun trying! 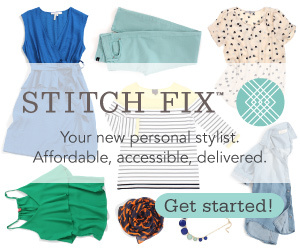 Then come back here and tell us what new styles you’ve discovered hidden in your closet! Eliza Loverly is a journal collecting, card making, old fashioned soul. Most days you will likely find her spending time with her family, or scribbling notes to herself! Love this article and love this girl!!! Thanks for the great information!!! !